When collecting watches it’s often the case that one particular brand is not too well represented and sometimes just for the fact that you never got round to it. And in the case of Bulova that’s probably right in my case, though that said I did have a Bulova Accutron 218 many years ago which I sold on at the time as payment for another model. However recently I bought an earlier Bulova from 1970 and for no other reason than I particularly liked the rather unusual case and dial layout. Note the luminous infill hour and minute hands, the red seconds sweep hand and the luminous dot markers at each applied minute marker, gives a clearly defined dial (note the luminous material no longer active). I particularly like the different background shades for the Day and the Date wheels, which aids clarity. And of course how could you miss the vertical Day and Date @6 which sets it apart from most watches and if honest the main reason for my purchase. The case is in polished Stainless Steel and oval in shape and whilst I’ve heard it called the UFO case, though maybe a personal observation by an owner and certainly not official, it is in fact quite a rare shape for a Gents model and a very decent size at approximately 37.5 mm wide and 39 mm lug to lug, and as a result it sits well on the wrist. It also has the Bulova Automatic Swiss 17 jewel movement so is well specified, though from the dial you wouldn’t know it was automatic, as it’s not printed on the dial, the only dial text being the “T -SWISS-T” mark and the large text Bulova name @12. For me however it’s just the combination of all of these factors that I find uniquely interesting. 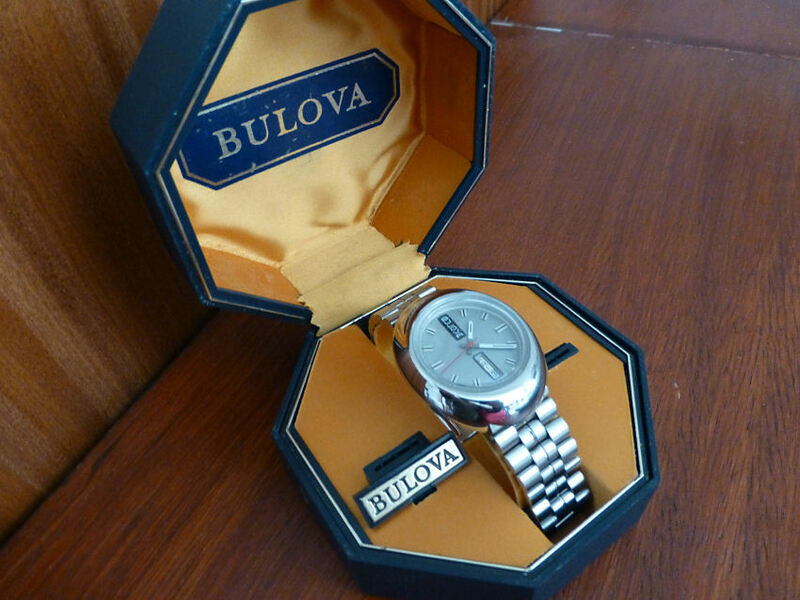 Bulova produced a large number of watches over the years and amazingly eclectic variations were available in the 1970’s but actually only a few models that featurde a vertical Day and Date display. Other were a 1972 Caravelle AK model and a 1973 Jet Star model 11634 with squared case and I’m delighted to say that my watch can be confirmed as the Golden Clipper model 11616 from 1970 (and the most expensive of the 4) and I attach an image from the 1970 McLeans Magazine advert running the Golden Clipper series and with the Stainless Steel 11616 model shown on the right. I note the advert text is sometimes difficult to read and has I think been misread in the MyBulova.com web site, but this clearer image shows it’s definitely 11616. The 2nd marketing image is a newspaper clipping, which also shows this model as part of another Golden Clipper advert. However it’s always nice to have your watch model validated and with Bulova it’s actually easier being a USA Brand when compared to most Swiss made watches, as the (USA) records are usually much better. But for the most comprehensive data I’ve seen, a visit to the mybulova.com web site and forum is very worth while being a mecca for Bulova owners, as it’s a terrific source of information. As to my new acquisition, I’m particularly pleased as it included the original Bulova watch box which is in very good condition. The watch itself was sold and described as 8/10 condition, though personally I might up that grading myself. Especially after checking out the movement which is in about as good a condition I’ve seen. Note the large italic B for Bulova cut out on the rotor which is a nice validation. Bulova Automatic 11ANACB with the B signed rotor in pristine condition. 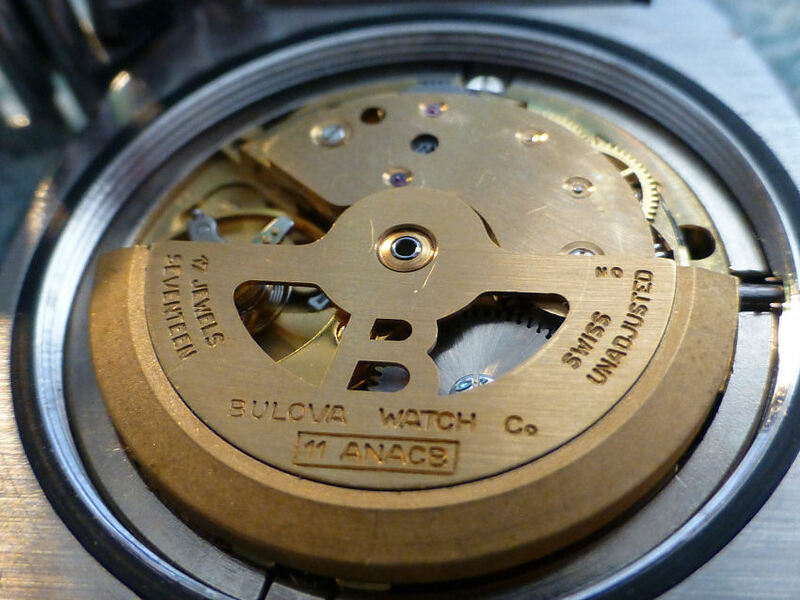 The movement is the 17 jewel 11ANACB automatic. Exterior wise after some careful and superficial cleaning with a small brush and cloth (no solvents used) the watch looks virtually as new. 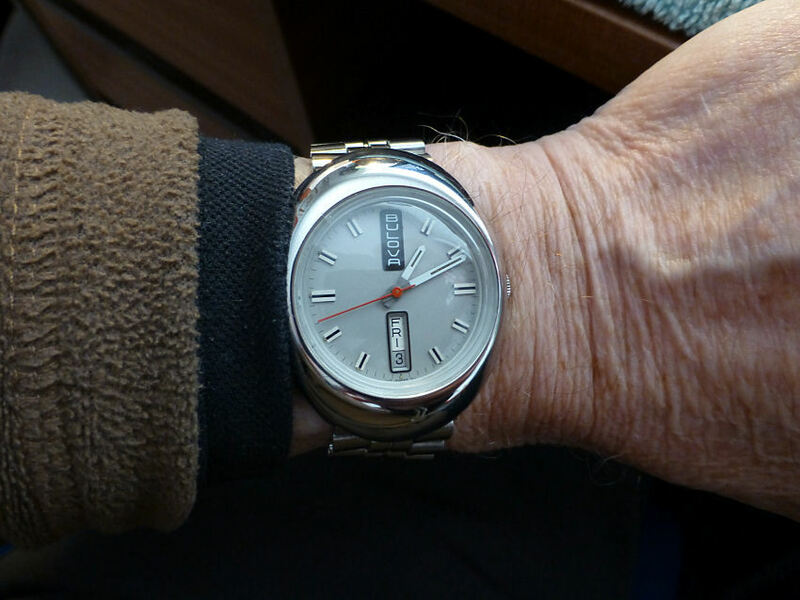 The stainless steel Kreisler Stelux bracelet signed Bulova is the original and in excellent condition and easily fit my wrist (the bracelet will fit up to approx 190 mm). For what is a relatively rare 45 years old vertical Day and Date @6 display Bulova Golden Clipper, the condition is pretty exceptional and has to be one of my best buys for a considerable time and I’m delighted. 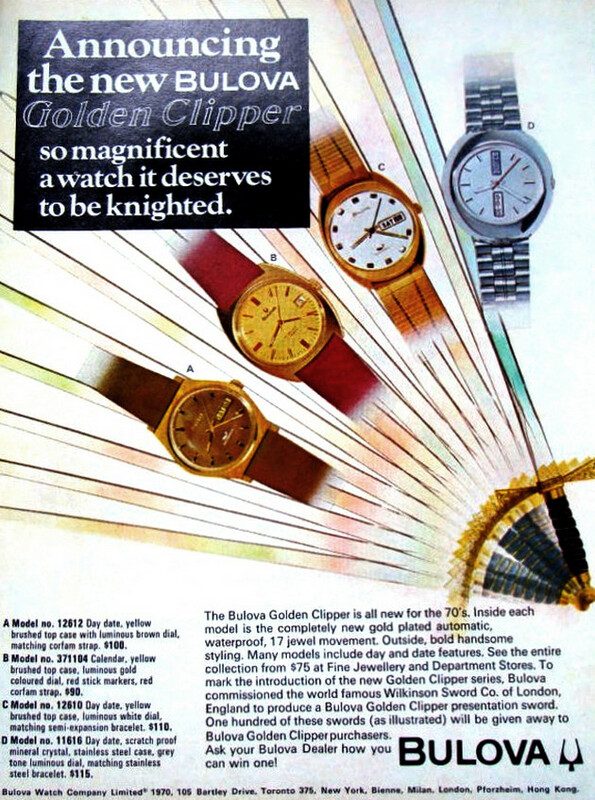 An interesting fact about the 1970 Golden Clipper series is that Bulova ran a promotional campaign, where they commissioned Wilkinson Sword Company of London to produce a limited run of 100 presentation swords, one of which would be offered each of the first 100 customers buying this model. With an etched blade inscribed- “Bulova Golden Clipper – Presentation Award 1970” on one side and the Wilkinson Sword mark on the other. A promotional gift they may be, but they are full size, beautifully made and uniquely Wilkinson and actually pretty rare today! In fact I could get one, but here in the UK importing such a sword might cause all sorts of problems, what with our Draconian blade laws. So whilst it would be nice to have the completeness of the collection (perhaps all 4 watch models plus the sword), I can probably do without the hassle. Condition wise this watch is really very good considering it’s age and it’s managed to pick up only two small dings (one on the case back and the other on the lower front of the case), but these are hardly noticeable, which is why I would grade it as good as I do. Setting the Day and Date on some of these old Bulova models can be tricky and time consuming, as there is no “quick set” Date here. Basically it’s by means of hands movement, backwards and forwards, then over the am/pm, back and forth etc. to get the Day, Date and Time as you would like. But that’s the way it is and I’m OK with that. On the plus side however, once set, the watch keeps excellent time and runs as smooth as silk. Another 1970’s advertisement from a newspaper of the period. Note – The price of this watch today, if using the selling price in 1970 as a guide, would be somewhere in the region of $700 – accounting for inflation of course (around 500%). So good value today, though I hasten to add I didn’t pay that! So that’s my latest vintage purchase and it’s noticeable that I’m tending to buy models that are not as old as I usually get. It might be that although there are plenty old ones still around, it’s definitely becoming much more expensive, especially if you are looking for good condition models. There are many, many models around which are frankly, in poor condition and in Auction Sales for example, the Seller seems to expect the same prices I used to pay for good condition models. Part of the reason of course is that Sellers have to pay sellers fees, so in their eyes losing their item’s value to them – so they expect more to compensate. However being a Buyer I’m also being hit considerably harder with what I now consider excessive Buyers fees, plus Vat and so on and I end up with an item which costs sometimes far more that its true value and that’s not really acceptable either. In the case of really good condition vintage models of the 1920-1945, the prices now can be really high and I’m not too sure if I’m happy paying those prices, though there’s always the exception. However in the case of the Bulova Golden Clipper here, I got this via Ebay from a bona fide Watchmaker/Dealer and in the end I was happy with my purchase as was the Seller. Now that’s surely a better deal all round.